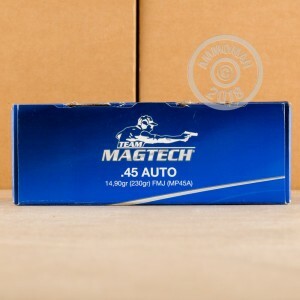 Order some 45 ACP Magtech ammo and head to the range! 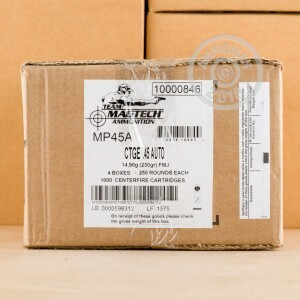 This ammo, manufactured by Magtech, is great for range training and target practice. The 230 grain full metal case bullet is equivalent to a full metal jacket, and excellent for both indoor and outdoor training facilities. The metal case prevents the lead from spreading and contaminated the environment as you fire round after round. 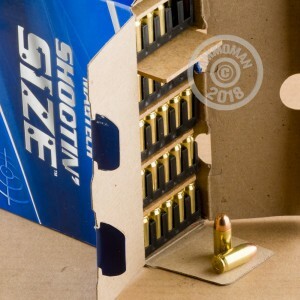 This ammo is a leading choice for top competitive shooters around the globe. It delivers an accurate shot, reliable firing with every round, and outstanding performance. It is brand new production in Boxer-primed, re-loadable brass cases. Magtech has been manufacturing and marketing top quality ammo since 1926. The manufacture all of their own components and have high standards for what they produce and deliver to their customers. You will be highly impressed with your 250 rounds. Great ammo shot well and is clean,I highly recommend this ammo. Great Ammo! Great People at Ammoman! I bought a box of this, it is really clean and accurate! Great Brass for reloading too! My shipment got beat up by Fed Ex some, and The Great People at Ammoman made it right! Very Fair to Me! I will Definitely keep buying from The Great People here at Ammoman.com! Blazing Fast Shipping! When These People say is is "shipped"
It IS Shipped! Unlike some websites that say it is shipped, but it really is not.